Records show that a brass band existed in Birchington as far back as 1934. A photograph which was taken in Crescent Road Birchington shows a band of at least twelve musicians then. Four brothers (the Hayward Brothers) arrived from Wales and immediately helped to form a brass band in the village. A loan was secured from a wealthy local businessman to provide cash to purchase some instruments. At this time it was known as the Baptist Band. Presumably its existence survived the Second World War because from the end of war until 1951 the band was renamed to The British Legion Band. The year of 1951 saw the change to the Birchington Silver Band. A rehearsal room was provided on the first floor of The Acorn Inn in Park Lane, a room not a lot bigger than the average family house lounge and with a spiral staircase from behind the bar up to the first floor, presenting great difficulty in getting the larger instruments (let alone the musicians) there for rehearsals. In those days the band was under the baton of a very talented conductor, Mr. George Ireland, who also conducted the Chislet Colliery Band. Word soon got around about the local band and the fact that it was inviting youngsters to attend and learn how to play brass instruments. With the assistance of others, tuition was lead by Mr. Evan Hayward, an excellent cornet and trombone player himself. This learner's class proved to be very successful and over a period of a few years other rehearsal rooms had to be found to accommodate the larger band. Moves made included a room to the rear of the Pewter Pot Inn and to a hall / classroom of the Park Lane Primary School. Another idea to progress the improvement in the band was a scheme to encourage musicians to move to the area from the North of England. This involved the purchase of a three storey property in Westgate-on-Sea and when ready several families moved to the area, paid a small rent for their accommodation and in most cases stayed with Birchington Band for some time. They finally purchased their own properties and the band`s building was sold. The mid 1950`s saw the Birchington Silver Band move its rehearsals to The Old Scholars Hut in Park Lane. Considerable internal alterations were made to the building by the members to provide a comfortable size hall. Under the baton of George Ireland the Band was able to give concerts at many of the local Bandstands and in fact the band has a poster advertising a performance at the "Oval" Cliftonville. In those days bands performing at the bandstand were engaged by the Margate Borough Council and they in turn charged the audience 6d (six old pence) for the use of a deckchair for the afternoon programme! Mr. George Ireland retired from the band in late 1950`s. Although Wilfred Hayward was deputy conductor a search was duly made for a successor. Arthur Hollands, who came from a Salvation Army background, was appointed and the success of the band continued. The Band gave many concerts both at fetes and bandstands, notably the Oval Bandstand at Cliftonville Margate and the East Cliff Bandstand at Ramsgate. On several occasions four concerts were performed at Herne-Bay over the Easter week-ends, the original indoor skating rink on the pier being one venue together with the Central Bandstand. Contests were also entered on a regular basis with some appreciable success. A considerable amount of travelling was involved in contesting as they mainly took part in London, Watford, Brighton, Folkestone, Chatham and Royal Tunbridge Wells but on several occasions visits were made to Southend-on-Sea in Essex. These were a long days out because with no M25 or Dartford crossing, the easiest way was to travel by coach to Gravesend, cross the Thames estuary by means of a small ferry and disembark at Tilbury. Another feature of the Bands engagements was visits to two of the local hospitals, Royal Sea Bathing Hospital at Westbrook and Princess Mary's Rehabilitation Hospital in Cliftonville. Patients were taken by porters, some in wheelchairs and others in beds, to the Recreation Halls for an evening programme of light music. The early 1960`s saw the introduction of regular day trips to France from Margate and Ramsgate. 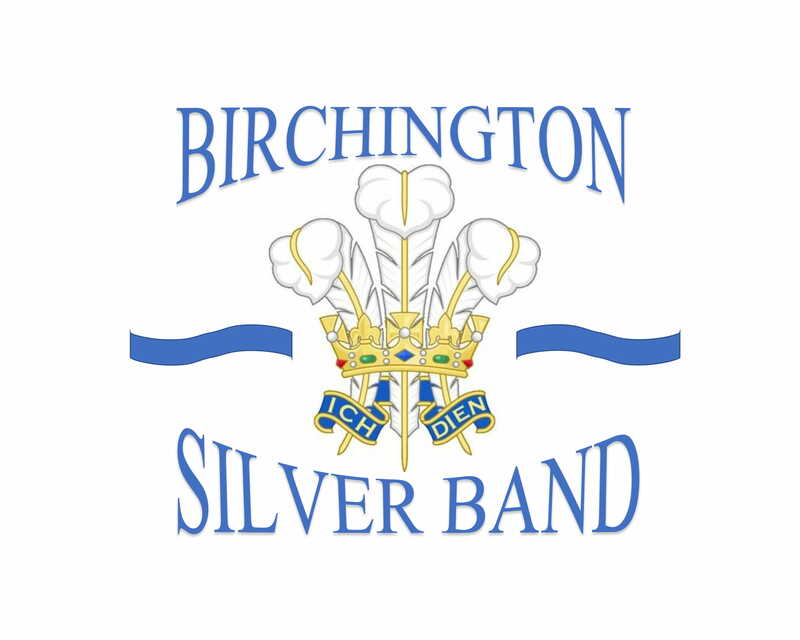 Birchington Silver Band was frequently invited to visit both Calais and Boulogne performing concerts on board, in local parks and on the quay sides. These were remarkable and enjoyable trips with meals and drinks provided both at sea and in the towns! In 1963 the band visited and enjoyed a memorable day on the first crossing to Dunkirk since the war on board the "MV Queen of the Channel". On this occasion the Band marched from the harbour through endless streets to the town centre where they were met by local dignitaries. Included in the itinerary for that visit was a visit to the British War Graves in the town where a service was given and music and hymn accompaniment provided by the Band. This was a truly memorable day in the Band's history. Arthur Hollands continued in his capacity as conductor for some nine years. During his latter time with the band he was giving tuition to Stuart Cates in order that he may become a deputy to him. Alas Arthur resigned from the Band and Stuart was appointed Musical Director in 1967 at the tender age of twenty six!! Having joined the learner's band with other youngsters in 1951 he very soon took up the position of first Trombone. This he continued to do for those sixteen years, alongside John Brenchley on Second Trombone and Tom Horton (seen in band photograph of 1934), on Bass Trombone. It was during the early years of the 1960`s that a strong social and supporters section was set up. Band dinner and dances became very popular, holding the annual events at many of the larger hotels in the area that existed in those days. One of the best locations was the Butlins Hotels in Cliftonville, where on one occasion 269 people attended. Another annual event arranged by the band social committee was a fete held at various grounds within Birchington. Members helped construct, provide and man a range of different sideshows which together with other arena events provided a good week-ends entertainment for the local people. This band activity was possibly the forerunner of a larger event that soon followed, the "Quexpo week-end" in August. This was organised by local people and supported by the band to provide funds for the building of the Village Centre. For a while the band continued its interest in entering contests. It was in the first year of Stuart being musical director that he took a very strong band to a contest at Hastings. The performance was good enough to bring away first prize. A few more contests were entered, Chatham, Folkestone and Tunbridge Wells, with no great success but with rising costs a decision was made to concentrate on being a concert band. An added engagement facility was provided with the construction and completion of The Village Centre in Birchington. It was decided at first to give eight concerts per year in the main hall for the people of Birchington. Since the start of these concerts people travel from further afield to listen and enjoy a good afternoon with the band. Although the band did not require the Village centre for rehearsal and storage, because they had their own facilities in Park Lane, using the hall for concerts was supporting the need for such a building in the village. The concerts proved to be very popular and increased to nine a year. They still continue to the present day. With the exception of a few Christmas concerts there has never been a charge for listening to the programmes, but the audiences are asked to support the band with collections and raffles. The early 1970`s saw the start of twinning arrangements for the town of Margate with Les Mureaux in France. Birchington Band was asked to investigate the possibility of a link with the French town. A party of three members from the band travelled to the town to have discussions with members of an "English Speaking" learning school and a School of Music. They returned with many suggestions and put them to the band members. Within the year a connection was established and they journeyed to Les Mureaux to give concerts. Music was also provided for the official twinning ceremonies in the town. Receptions were provided at the Town Hall by the local Mayor and council members of Les Mureaux and on one of the early visits became the Official Band of the town. Return visits by friends of the link have continued throughout the following years. Margate also has twinning status with a German town, Idar Oberstein, and the band has also made a week-end visit there. Exchanges still take place with Les Mureaux, but not on such a frequent basis. At the start of the 1980`s Stuart Cates returned to the trombone ranks. Other possibilities to becoming a conductor for the band were introduced and finally Mr. Charley Francis with a military background was appointed. After a short while Mr. Francis left the band and Stuart was once again asked to take up the baton in 1983. In fact Stuart is still currently (2011) the Musical Director to the band. For many years now it has been difficult to recruit youngsters to learn the art of playing a brass instrument. Although tuition is given by local schools few transfer to the band either during or after their school years - perhaps too many alternative hobbies these days. Raising funds for providing decent instruments for the musicians as well as purchasing new music has always been a main concern of the committee. In fact loans have been made available by members before now. However, in 1996 a bid was made for a grant from the National Lottery. A substantial grant was made available and with the band providing some of their own money into the project resulted in the purchase of a set of new instruments. After a lot of time and effort how wonderful it was to give the first performance with the new instruments at the Village Centre in Birchington on 18th May 1997. Organized regular committee meetings together with the support of Presidents, Vice presidents and helpers at events over the many years have ensured a smooth running to the organization.